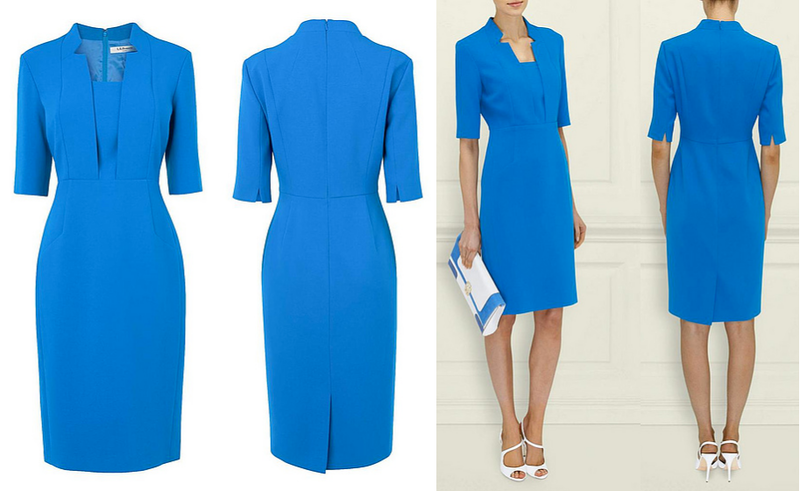 Kate stepped out wearing her 'Detroit' dress by LK Bennett, with new navy Jimmy Choo pumps. 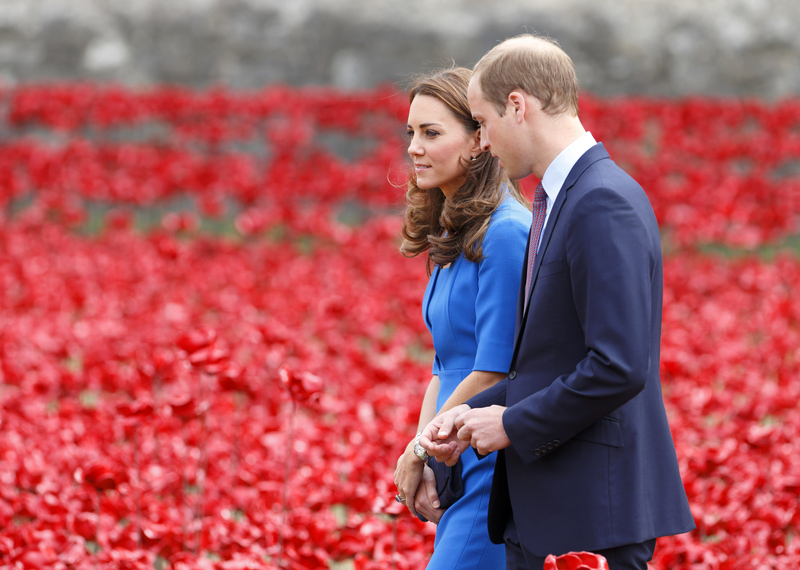 Kate and William walk through the field of poppies. The Duchess looks down at the countless red poppies. Kate and Wills smile at each other during their visit to the Tower of London. Each of the young royals were given a poppy to plant. It seems Kate was a bit overcome by the exhibit, which we imagine most are when they arrive. The Tower overlooking its field of poppies. Prince William plants his ceramic poppy. Kate laughs with Prince Harry. The royals taking a walk through the field. The Duchess was in royal blue for this morning's visit to the Tower of London with Prince Harry and Prince William. Above the group is welcomed by the General, the Lord Dannatt (Photo: Tower of London Facebook page). They were at the Tower to see the spectacular "Blood Swept Lands and Seas of Red" art installation. The exhibit is part of the World War I Centenary observances. With yesterday's events in Belgium top of mind it is staggering to think each of the poppies represents a British or Colonial fatality from the War. 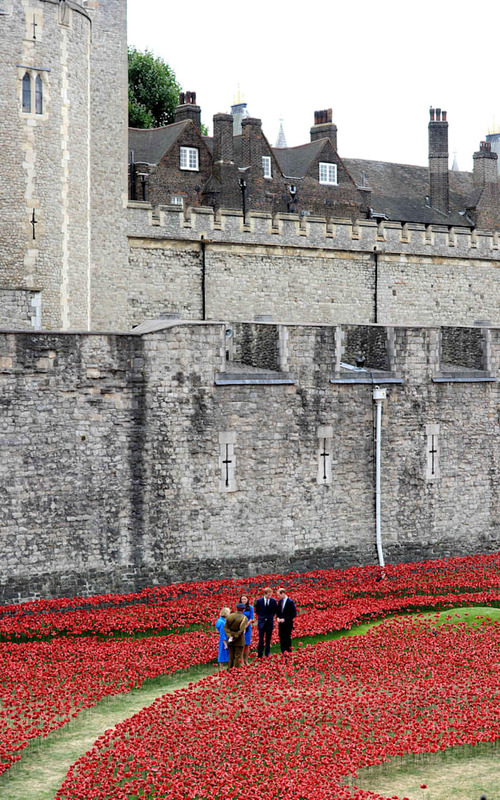 Hundreds of thousands have been 'planted,' by volunteers, but there are thousands more to plant: ultimately 888,246 ceramic poppies will fill the dry moat. Each of the royals was given a poppy to plant. As many readers will have quickly recognized, Kate was in her 'Detroit' dress by LK Bennett. The frock has been reissued: it is available in limited sizing on the US/Canada website ($395); the size selection looks more robust on the UK/INTL (£225) site. The Duchess was in a new pair of Jimmy Choo heels, the 'Georgia' style in navy suede. The shoe is also available in Blush Leather ($625) at Jimmy Choo, as well as Black Patent Leather ($499) at multi-brand retailer Net-a-Porter. Kate accessorized with her Stuart Weitzman for Russell & Bromley 'Muse' clutch. There was also a new piece of jewelry today, a necklace by Mappin and Webb. For more from WhatKateWore, click here and look through the gallery above for more photos of the royals at the Tower of London today.